If respiratory diseases were not enough, it has been reported that air pollution will serve as a major threat to the human kidney too. In a recent study conducted at the University of Michigan, Air Pollution – Which is very similar to the toxins produced while smoking, can cause Chronic Kidney Disease (CKD). Jennifer Bragg-Gresham – The lead author of the study said that “Kidneys have a large volume of blood flowing through them, and if anything harms the circulatory system, the kidneys will be the first to sense those effects.” Rajiv Saran who is a co-author Michigan Medicine nephrologist has also stated that a comparative graph of heavily polluted versus less polluted areas have clearly shown that Chronic Kidney Disease was likely to be found more in the heavily polluted areas. We all understand the adverse effect of air pollution in our lives. With every passing day, air pollution is only increasing. Pollution in our city may not be visible enough to our naked eyes but the impact can easily be felt in our bodies every now and then. Common health issues such as nausea, cold, and flu, restlessness are a few symptoms which are often heard during high pollution days. In recent years, several studies have reported that breathing polluted air can cause a greater number of long-term health issues when compared to smoking cigarettes. Poor outdoor air quality is caused primarily due to vehicular emission. During high traffic days, while people wait for the traffic signal to turn green, 9 out of 10 people keep their engines on. This produces a high level of nitrogen dioxide which is quite dangerous to human health. It is a known fact that people suffering from CKD have an increased risk of cardiovascular mortality. Bragg-Gresham insisted that countries which have a higher level of Particle Pollution – Especial PM 2.5 are bound to have increased numbers of CKD cases. Similarly, a study from St. Louis VA Medical Center looked into the screening results of more than 2.5 million veterans whose cases were followed over an average of 8.5 years. It was found that with every increase in pollution of 10 micrograms per cubic meter of air, there was a 25 to 37% increase in elders who were suffering from kidney disease. The study came to a narrow analysis that 45,000 new cases of CKD were found and 2438 patients started dialysis. • Check the level of pollution on outdoor pollution monitoring app now available on Apple App Store and Google Play store. • Avoid outdoor activities, especially on high pollution days. • Wear a pollution mask before stepping out of the house. • Use less energy indoors such as switch off lights of the room after use or shut down electronic gadgets when not in use. • Walk, ride a bicycle or take public transportation. • Carpool instead of driving to work on a daily basis to save fuel and reduce unnecessary fuel emission. • Don’t dump garbage on the street side after cleaning the outdoors. • Do not burn garbage waste or wood – it is one of the contributing factors to ambient air pollution. • Encourage your children to support the cause in reducing air pollution – indoors and outdoors. • Communicate with the administration of your kid’s school to find ways to reduce school bus emission. • Don’t smoke tobacco indoor or out in front of people who are sensitive to smoke or allergens. • Keep yourself well hydrated and intake high protein diet for a healthy lifestyle. • Use air purifier indoors – especially when there is high pollution alert for the day. In the times when respiratory problems are getting more or less out of hands, we simply can’t let Air Pollution fuel the Chronic Kidney Disease too. The symptoms of CKD will be more visible in heavily polluted cities pretty soon. 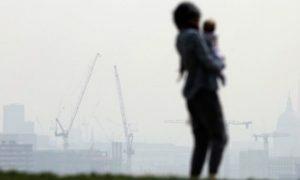 However, cities with better Air Quality can still try their hand in controlling or completely eradicating the way pollution can affect their Kidneys. As citizens we need to stop looking for help from the government. A little contribution from within does more help than anything else. Applying these above-mentioned points will definitely help yourself and your loved ones to breathe healthy air.